"Fantastic! Kuniyoshi (1797–1861), Demon of Prints"
"Fantastic! Visionary Prints from Goya to Redon"
Utagawa Kuniyoshi, Retired Emperor Sutoku Sends his Followers to Rescue Tametomo (1851), woodblock, triptych of Oban-format prints, 39 × 79.5 cm. Private collection. Photo: Courtesy of Gallery Beniya. In the weeks after the terrorist attacks in Paris last November, museum attendance in the city plummeted; visitors to the Louvre diminished by more than a third and attendance at the Pompidou fell by 50 percent. 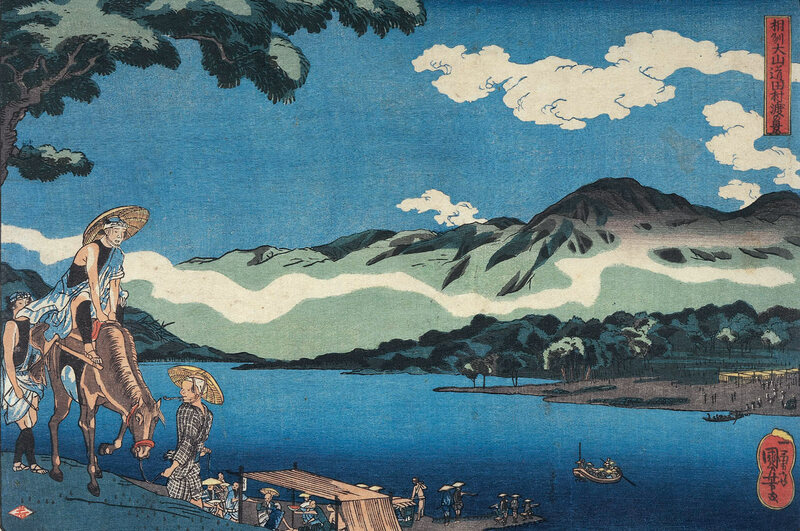 Meanwhile, an exhibition at the Petit Palais of works by a little-known Japanese woodblock artist was breaking records: by the time the exhibition closed, well over 100,000 visitors had braved hours-long lines to get in. The wait was well worth it—Utagawa Kuniyoshi’s prints are thrilling. Bold, imaginative, vibrant, his images not only deal with the bizarre, the grotesque and the macabre, but also deliver frequent moments of loveliness and grace. Although created well over a century ago, they have a startling modernity; precursors of the comic strip, they have inspired Hayao Miyazaki and countless other manga artists and filmmakers. Utagawa Kuniyoshi (1797–1861) was born in Edo, the son of a silk dyer. His prodigious drawing talent was recognized at the age of eleven, when the famous ukiyo-e print master Utagawa Toyokuni2 invited him to become a pupil. He remained Toyokuni’s apprentice until 1814. Despite his promising debut, the young Kuniyoshi received few commissions, and eked out a living doing odd jobs such as repairing and selling used tatami mats. All this changed in 1827 with the publication of 108 Heroes of the Popular Water Margin All Told, a version of a sensationally popular 14th-century Chinese novel, Shuihu Zhaun (The Water Margin).3 The story recounts the adventures of Song Jiang, a real-life Chinese Robin Hood who led a peasant uprising in the 12th century,4 and Kuniyoshi’s series of single-sheet warrior prints brought overnight success. 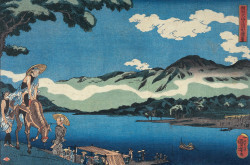 Utagawa Kuniyoshi, View of Tamura Ferry on the Road to Öyama in Sagami Province (ca. 1842), woodblock print, Oban format, 26.5 × 39 cm. Private collection. Photo: Courtesy of Gallery Beniya. In Kuniyoshi’s warrior prints, the comic-strip format appears for the first time; compositions arranged in multi-panel sequences form a narrative or show various viewpoints of a single situation. He also invented the triptych format of ukiyo-e prints by joining three prints together to depict a single scene. In his interpretation of Kyokutei Bakin’s Strange Tales of the Crescent Moon,6 a gigantic fish—its scales rendered in exquisite detail—and stylized, billowing waves overflow from one sheet to the next, unifying the composition. The triptych Princess Takiyasha Summons a Skeleton Specter to Frighten Mitsukuni (ca. 1845–1846) illustrates a 10th-century legend about the daughter of a murdered renegade warlord. When the emperor’s official comes to the ruined palace searching for surviving conspirators, the princess conjures an enormous, grinning skeleton, who pulls back the curtains with bony fingers and leers through the palace windows.7 It is one of Kuniyoshi’s most famous images (and the source of a scene in Miyazaki’s 1994 animated film Pom Poko). The first section also reveals the artist’s surprising awareness of Western perspective and chiaroscuro. Fascinated by Western pictorial practices, Kuniyoshi closely studied a set of 1682 engravings by Johan Nieuhof, the Dutch merchant and explorer.8 Kuniyoshi’s Act XI of The Chûshingura, The Night Attack (ca. 1830–1835),9 a detailed street scene, duplicates almost verbatim one of Nieuhof’s compositions. The clouds and mountains in O’Kane, the Brave Woman of Omi Province (ca. 1831–1832), also show his fascination with Nieuhof’s compositions. Prints such as the Ghost of Akugenda Yoshihira Striking Down his Killer (1825), exhibit a radically modern approach to composition, with no fixed viewpoint or center of interest. The dynamic lightning bolts of this triptych brings to mind Paolo Uccello’s lances and horse hooves in Battle of San Romano (ca. 1435–1460), though it is not clear Kuniyoshi knew that image. In addition to his spectacular warriors and supernatural scenes, Kuniyoshi excelled in highly expressive portraits of extravagantly costumed Kabuki actors, skillful likenesses that were easily recognized by the public. Illustrating important scenes from the plays, the prints attracted spectators and were sometimes sold as performance souvenirs. 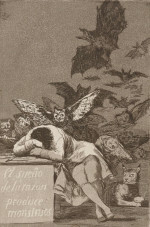 Francisco de Goya y Lucientes, plate 43 from The Caprices (Los Caprichos): The Sleep of Reason Produces Monsters (1799), etching, image 21.6 x 15.3 cm. Bibliothèque nationale de France. ©BnF. Another section assembles prints of the lush countryside outside Edo in changing seasons; particularly beautiful were prints of summer evenings, the skies alight with fireworks alongside the Sumida River. In such works as View of Tamura Ferry on the Road to Öyama in Sagami Province (ca. 1842), Kuniyoshi’s treatment of sky, clouds and light-dark contrast have a realistic, almost photographically modern viewpoint and further reflect his interest in Western painting. Although his warrior and actor prints were not in fashion in France during the 19th-century Japonisme craze, Kuniyoshi’s landscapes were highly esteemed; Claude Monet owned several. In 1842, the shogunate established a number of puritanical laws prohibiting publication of portraits of geishas, courtesans or actors. Rather than thwarting him, the ban incited Kuniyoshi to produce subversive, humorous and satirical images that evince a shrewd, Daumier-like social observation. His talent for caricature and his boundless imagination were unequalled in the history of ukiyo-e. The symbolism of his caricatures—demons and monsters and anthropomorphic animals—was oblique enough to escape the censor, yet explicit enough for his public to appreciate. These works were the show’s most exhilarating: parody portraits of geishas or Kabuki actors recast as animals or toys; frogs with actors’ expressions; goldfish singing and dancing in the streets; cats having a tea party, playing ball games or, in the witty triptych Cats Shown as the 53 Stations of the Tokaido (ca. 1847–1850), posed to represent specific rest areas along the road connecting Tokyo with Kyoto. And in the fanciful Yoshiwara Sparrows’ Temporary Nest (1846), Kuniyoshi depicts the red-light district in bird form, where courtesans in extravagant robes await prospective customers. To complement this spectacular show, the Petit Palais organized in the adjoining galleries a selection of nearly 200 19th-century phantasmagoric prints from the Bibliothèque nationale de France. 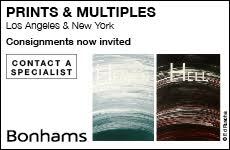 Beset with ghosts and monsters, yet sensationally beautiful, the exhibition offered a once-in-a-lifetime opportunity to see dozens of great works up close. It opened with this famous image: A man sleeps at his desk. Around him the monsters of his dreams are stirring: bats, cats and owls emerge from sinister darkness; a lynx lays quietly beside him. At the center of the composition, another nocturnal creature stares not at the sleeping artist but directly at us, as if to force our active participation. 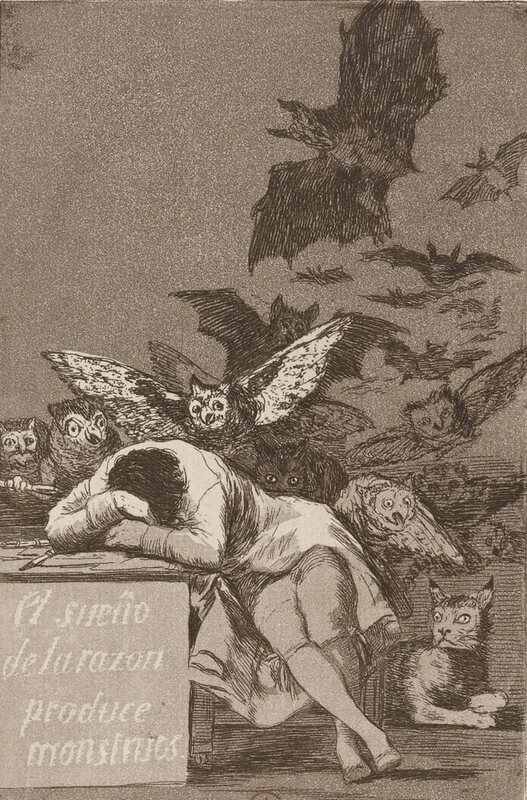 Francisco de Goya’s The Sleep of Reason Produces Monsters (1799) from the Caprichos acts as an introduction to the 19th-century gothic pictorial imagination. Like Kuniyoshi, these artists explored a macabre world; unlike Kuniyoshi they emphasized the power of black and white as a visionary language, capable of transcending everyday reality and opening onto other worlds. Curated by Valérie Sueur-Hermel, head curator of prints and photography at the BnF, and Gaëlle Rio of the Petit Palais, the exhibition highlighted three generations of Romanticism: the historical Romanticism of the 1830s, typified by Eugène Delacroix; the neo-Romantics of the Second Empire, centered on Gustave Doré; and fin-de-siècle post-Romanticism leading to Symbolism, with a special gallery dedicated to Odilon Redon. Hung alongside the Goya at the entrance were other masterpieces that Sueur-Hermel considers “tutelary figures” of 19th-century gothic imaginings: Dürer’s enigmatic Melancholia (1514), Jacques Callot’s Temptation of Saint Anthony (1635), Rembrandt’s mysterious Dr. Faustus (ca. 1652), one of Giovanni Battista Piranesi’s labyrinthine imaginary Prisons (1749), and an engraving after Henry Fuseli’s Nightmare (1782), one of the very few colored works in the show. These were followed by a room of monsters, witches and ghouls inspired by literature or classic fantasies. Delacroix’s powerful 1825 lithograph Macbeth Consulting the Witches and his bold illustrations for Goethe’s Faust (1828)11 (one of the best illustrated books ever published) are gorgeous examples of an artist learning to exploit lithography, introduced to French studios just a decade earlier and embraced for the suggestive power of its blacks, the immediacy of its process, and the flexibility and freedom in drawing it afforded. 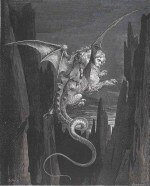 Other fine illustrations included the elegant wood engravings of Antoine Johannot (1803–1852; dubbed “the king of illustration” by Théophile Gautier) and the proto-Surrealist Un autre monde (1844) by J.J. Grandville, which exerted an influence on Max Ernst, André Breton and Lewis Carroll. 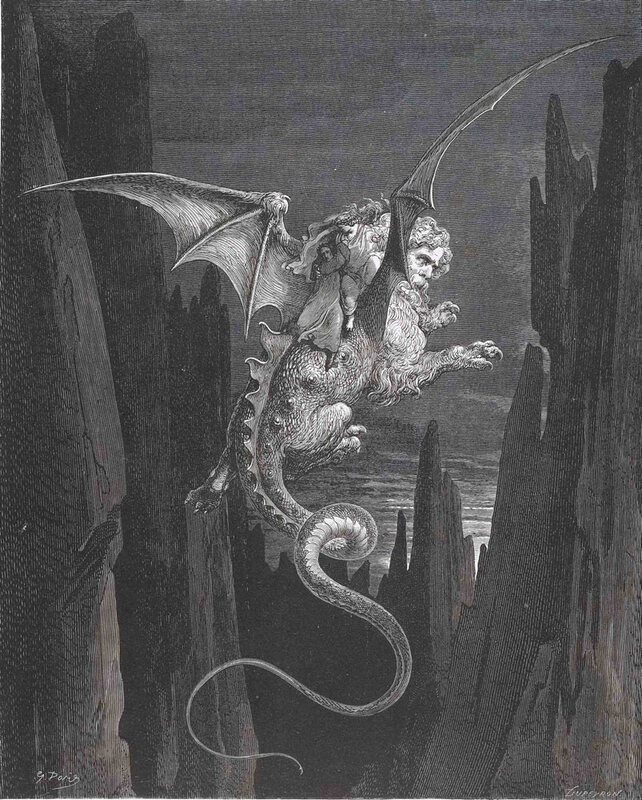 Gustave Doré, Then was I still more fearful of the abyss (The descent into the abyss on Geryon’s back, from Dante’s Inferno (1861), wood engraving, 24 x 19.2 cm. Bibliothèque nationale de France. ©BnF. Though Realism was flourishing by mid-century, artists such as Alphonse Legros and Félix Bracquemond ventured at times from their usual Realist avenues and into the macabre and the fantastic, as seen in the exhibition’s second section. Here we also see Charles Meryon’s intense, obsessive etchings of Paris, Gustave Doré’s 1861 wood engravings for Dante’s Inferno with their powerful chiaroscuro effects, and Rodolphe Bresdin’s astonishingly detailed, lithographic tour-de-force, The Good Samaritan (1861). The show closed with rare impressions by Félix Buhot (1847–1898) and with Max Klinger’s famous Paraphrases about the Finding of a Glove (1877–78), made when the artist was only 21. Klinger’s psychosexual etching series tells the tale of a single, white, elbow-length glove lost by a young woman at a roller skating rink. It becomes a fetishized, sexually charged object for the protagonist, who elaborates obsessive fantasies about its journey; in one plate, for instance, the glove is stolen by a strange winged creature while the young man reaches out desperately through a window. A potent symbol for love, longing and loss, Klinger’s glove was a fitting ending for this unforgettable show from the last dazzling period of bravura draftsmanship before the arrival of modernism.